Research Primary School held it’s own Anzac Ceremony today in the Gym. All the students arrived with a poppy they had made, and respectfully added their poppy to the collection as they entered. Mr Whyte then spoke about the significance of Anzac Day and why we participate in ceremonies at this time. The students then watched a short powerpoint on Anzac Day on the big screen. We then talked about the Honour Roll we have at school to commemorate those from Research who went to the Great War. At the end of the ceremony we held a minutes silence, sang the National Anthem then listened to a song “The Last Anzac”, and watched an accompanying video. Pippa and Hayden, our School Captains, then helped Mrs Pagon, Jaqui Doherty and the JSC members plant a Gallipoli Oak in the school grounds, which we we had been given to help commemorate 100 years since landing at Gallipoli. 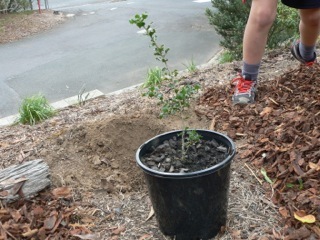 The tree was grown from acorns originally sent to Australia by soldiers fighting at Gallipoli in World War 1. Jacqui is a direct descendent of a Gallipoli veteran and proudly wore his medals today at assembly. Miss K’s class then spent some time this afternoon creating a ‘100’ display on the fence using all the poppies, which you may see as you drive past this weekend.